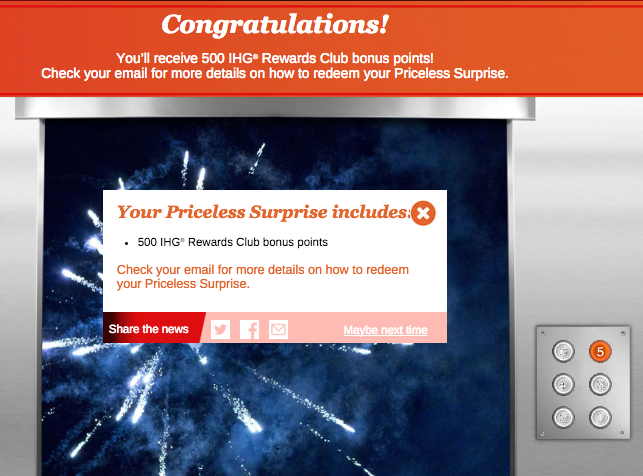 I last wrote about the IHG promotion when I had just learned of it and had put some effort to trial it out. I sent in 10 envelopes that with hand-written notecards made of the details (mostly address, account numbers, etc) to submit an entry. It took me a little over three weeks, but I did receive 9 emails (and 1 a few days later) with the information on how to play. 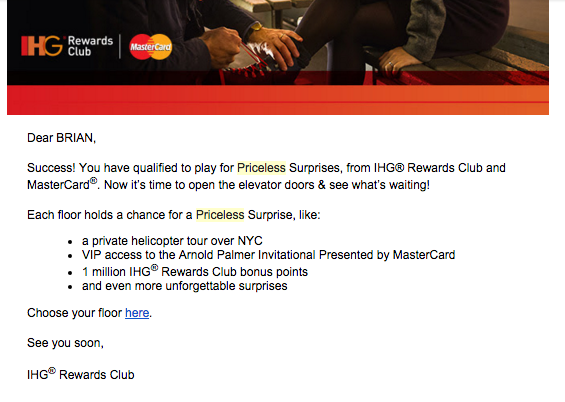 I still haven’t actually received an email from then explaining how to “redeem my Priceless Surprise” but I checked my account balance using Award Wallet and was impressed to see the total amount of points had already been added to my account (I had received one 1000 point bonus). After talking to my wife about this success, she and I both are going to submit the 94 entries each (only 84 for me!) to get our points. The promotion goes until February 15, 2016. Good luck!